Welcome to Brinson Entertainment Rentals, one of the fastest growing and most reliable inflatable rentals company around. 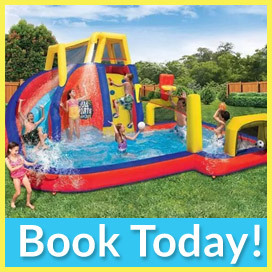 Brinson Entertainment Rentals offer variety of inflatables including water slides and combo units and we serve the tri-state area up to a 75-mile radius surrounding the home office of 1864 Madison, Memphis, Tennessee 38104. We are continually looking to add new and innovative inflatable units to our rentals. All of our inflatable units are brand new, cleaned, inspected, and sanitized after every use and before we rent them. All inflatable units meet the latest standards for safety in design and operation. All of our products are safe and meet ASTM safety standards. Brinson Entertainment Rentals provides inflatable rentals services for all occasions from backyard birthdays to corporate picnics, county and city festivals, grand openings for businesses, church festivals, day care center and school events. Why Choose Brinson Entertainment Rentals? We are devoted to providing our customers with the best quality service along with the safest, cleanest, and newest inflatable units that will make any event unforgettable. Our inflatables are designed to provide the utmost excitement whatever the occasion may be. We ensure all our inflatable units are inspected, cleaned and sanitized before every use. All inflatable units are lead free.